God does NOT curse His children, but we, through our own attitude, have the ability to curse ourselves. God makes a convenient scapegoat. I should know because I blamed him for my singleness for many years. Of course, that's an insult to God, but thankfully you and I are so limited in understanding what's going on in our lives that God forgives us for that, just as forgives all our sins. I made the same mistake as every other person who believes singleness is a curse, but I want you to avoid doing what I did. And if you're already doing it, I want to show you how to stop. This may be a painful article for many, but pain is a sign there's a problem. Following God's guidance, we can each fix this problem and get on to happier living. So let's be grown-ups and explore the question, "Is singleness a curse?" to an ember just barely alive? then flicker to flame and survive? just to surge and rise up even higher? or the skill you put forth to win. but the One whom you put your hope in. never give in to the pain. keep thinking of what you will gain. He'll give you the power to cope. for while there is life there is hope. Let's unpack the three-fold wisdom of this statement. First, a spouse cannot satisfy a Christian's heart, contrary to singles' popular belief. If they could, no one would get divorced. 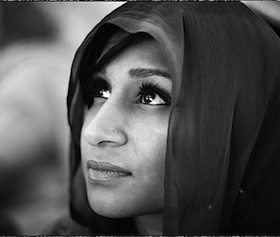 Even in happy marriages, Christians still need to put God first. Second, nothing produced by man can satisfy a Christian's heart, from material possessions to books and movies to sports to money. Things produced by man cannot satisfy the hunger put there in us by God, for Himself. And third, no Christian man or woman can satisfy their own heart. Self-help is a lame substitute for God-help. We can't make ourselves right, despite all our trying. Positive thinking won't do it; yoga and meditation won't do it. One of the great secrets of life is that only God can satisfy a Christian's heart. I have wasted much time looking in other places, and every so often, after a disappointment, I have to learn this lesson again. If you are honest with yourself, you will learn this same lesson too. Treat yourself to an attitude adjustment! Many years ago, when I worked for the Central Illinois Light Company, the electric utility in Peoria, Illinois, a bunch of us would visit a local watering hole occasionally for what my coworker Vicki called, "An Attitude Adjustment." Since I'm a teetotaler, I drank soda while my friends drank beer. We commiserated about work and usually left with a healthier perspective--we were all happy to have a steady paycheck. Maybe you need an attitude adjustment about the single life. My ebook, Hope for Hurting Singles, can help. 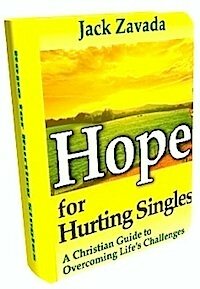 Hope for Hurting Singles is a 146-page ebook in PDF format. When you purchase it, you'll be reading it on your computer within minutes. It's only $9.97 and comes with a money back guarantee. There's also a Kindle version. Your life really can get better. Make the changes I made. Find out how with Hope for Hurting Singles. Because I believe we can never hear often enough about how much God loves us (and because I'm the Boss Man of this newsletter), our June bonus feature reminds you how much God loves you, single friend. Enjoy! We are not built for ourselves, but for God. Not for service for God, but for God. When the time comes for you to die, you need not be afraid, because death cannot separate you from God’s love. Here's the paradox. 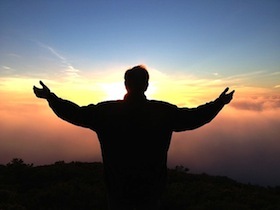 We can fully embrace God's love only when we recognize how completely unworthy of it we are. Oy, this single life! What's a person to do? As I write this, a severe thunderstorm is raging outside. Louie, my dog, has just sneaked out of my office to hide under my bed. And there, my friends, is a mini-parable of what the single life is sometimes like. When things are going badly, we all feel like hiding under the bed. Or at least under the covers. Lots of "sophisticated" singles (hint: unbelievers) cope with hard times with alcohol, drugs, or s'ex. They think they're mature, but when has shallowness ever been mature? You want real help? Go to God. There are no harmful side effects, and you won't feel lousy in the morning. There is nothing--absolutely nothing--as great as Jesus! We covered some pretty heavy stuff in this month's Inspire-O-Gram. I'm curious about your reaction to this issue. You can email your bouquet or brickbat to me using our deep-fried contact form. There's your June issue, fellow singleton! If you want to learn more about Christianity, kickstart your keyboard and travel to www.christianity.about.com, where you'll find tons of interesting stuff. I hope you're enjoying your summer, or winter, for our friends Down Under. Until July, keep the faith!